The health benefits of lemons are immense and most of us know about it already. It's widely used in home-remedies to deal with minor ailments too. But most of the time we only make use of the juice and discard the rind or peel. Now that's a shame because the lemon peel contains more nutrients than the juice. In order to get the most out of a lemon, it's better to consume it as a whole. Now I do admit that it's not possible to use a whole lemon every time, but you must at least try using it in at some of the dishes. Now I'm gonna share with you one such dish in which you use make use of the whole lemon along with the rind. It's a tasty chutney that goes well as a side-dish with rice and curry. Before that, let's look into some other ways in which he lemon peel can be utilized in cooking. If you have a lemon plant in your house and get a surplus of lemons, then store them in the deep freezer. Whenever you need one, you can just take it out and grate it and add them to your salads, gravies and other dishes. Or you could even add them to your herbal teas and other drinks. 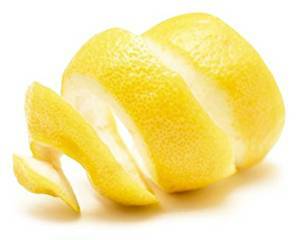 Lemon peels add amazing flavour to your dishes but do remember not to add too much for it for it may spoil the taste. Lemon is rich in fiber and low in calories. 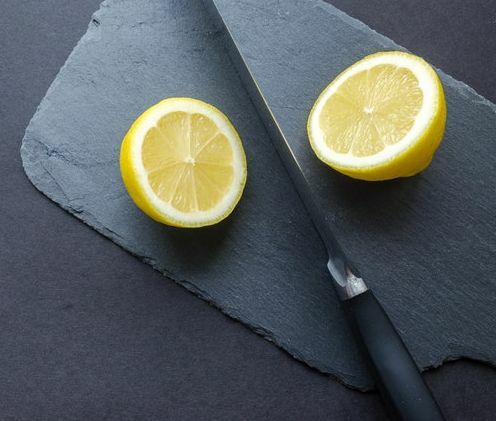 Though lemons are acidic on their own, they are alkaline in the body once they are metabolised! The minerals in lemons help to alkalise the blood. An alkaline body resists several diseases including cancer whereas an acidic body provides a conducive environment for various ailments. In animal studies and laboratory tests with human cells, compounds in citrus fruits, including lemons and limes, called limonoids have been shown to help fight cancers of the mouth, skin, lung, breast, stomach and colon. Another study, from 2004, states that limonoids slow down tumor growth in the mouth as well as the growth of added cancer cells the moment a tumor is formed. Lemon provides adequate Vitamin C. Vitamin C boosts the immune system, thereby preventing many infections and diseases. Lemons have a strong anti-depressive effect. Due to the presence of polyphenol flavonoids, consuming whole lemon can decrease cholesterol level, thereby decreasing the risk for heart diseases. The bioflavonoids in lemon peels also help in reducing your levels of oxidative stress. The vitamin C in lemon also helps wit dental like gingivitis, bleeding gums, and scurvy. Whole lemon also helps to get rid of intestinal worms. Lemons being high in potassium also helps to reduce high blood pressure. As you all know, Vitamin C is great for the skin and reduces wrinkles and blemishes. Adequate Vitamin C in lemons and peels ensues that you have a flawless, youthful skin. Also read: Lemon as beauty aid. Caution: People who have a problem of kidney or gall bladder stones mustn't consume lemon peels (lemon juice is alright) as the peels have oxalates. When oxalates become too concentrated in body fluids, they can crystallize and cause health problems. & finally salt to taste. Cut a round piece from the lemon (ref. fig), remove the seeds if any and boil it in some water and let it cook until it's soft. Now take 1-2 tsp of oil in a pan and fry the chana dal, urad dal / black gram dal, coriander seeds, black pepper, methi seeds and the red chillies one by one. Keep aside. Now put the cooked lemon in a mixie jar and add the coconut gratings, fried ingredients, salt and jaggery and grind it to a smooth paste. Now in a pan add some oil and do the tempering / tadka. That is, add oil, mustard seeds red chillies, hing and curry leaves. When mustard seeds start spluttering add the ground paste from the mixie and gently fry the paste adding a little water. When it cools, take it out in a bowl. Your whole lemon chutney or Nimbe Gojju is ready. You can preserve it in the fridge for up to 2 days. Tastes great as a side-dish with rice and curry. 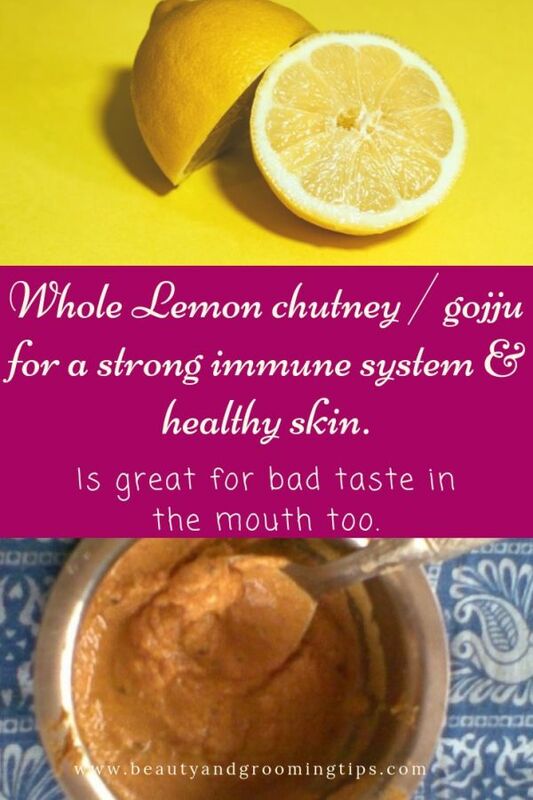 Especially when you are recuperating from fever, cold or any illness, you normally have a bad taste in the mouth. This chutney tastes great in such cases. Note: Stick to the quantities of the ingredients mentioned. If you add a larger piece of lemon or if you lessen the quantity of ingredients that are to be fried, the chutney may taste sour or bitter. Preferably, use an organic lemon. 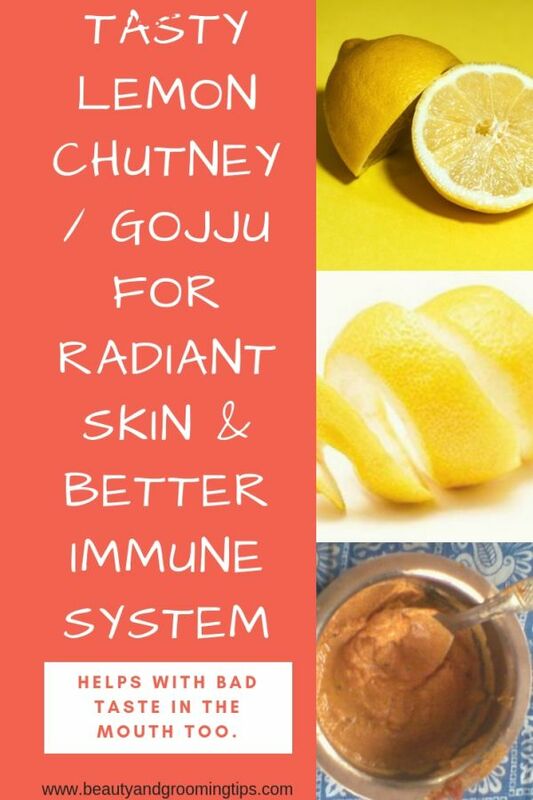 Do prepare this tasty chutney every now and then and savor it not just to beat bad taste in the mouth but also to get radiant complexion, healthy skin, better immunity and overall good health. References: Whole Foods, Natural News.